Mining is one of the most dangerous industries in the country. On average, 2 Missouri miners are killed each year and over 100 are injured while working in the mines or caves. To help make Missouri’s mines and caves safer, the Division offers FREE programs to train Missouri miners on implementing safe and healthy working habits at the workplace. Services include: safety and health, first aid, cardiopulmonary resuscitation (CPR), and mine rescue. The Missouri Mine Safety and Health Training Program is designed to help miners and the mining community reduce accidents through education, training, hazard elimination, and assistance provided to miners in accordance with Missouri state laws and regulations and the Federal Mine Act of 1977. Free on-site training and consultation are available, and will be tailored to your site. 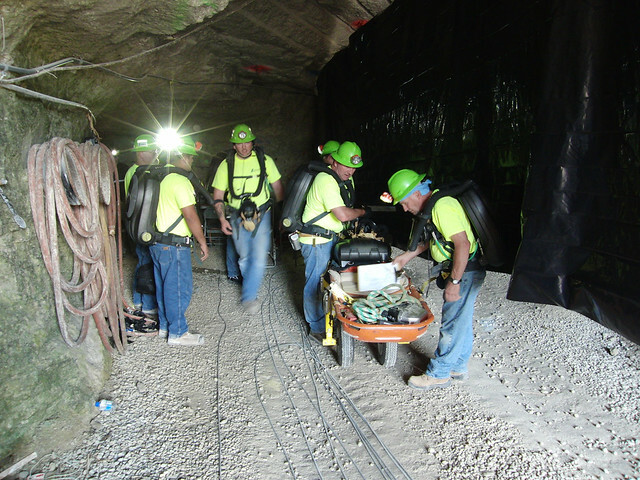 A brief consultation and inspection audit will be arranged by one of the Division's Mine Safety and Health Administration - (MSHA) certified instructors to determine your needs. Consultation Services are offered on the following topics: safety and loss control, MSHA training plan, evacuation plans, ventilation plans, substance abuse, cardiopulmonary resuscitation, hazard awareness, hazard elimination, job safety analysis, 30 CFR Parts 46, 48, 56, 57 and 77, accident investigation, revised Missouri statutes, and site inspections. Owner/operators, contractors, sub-contractors, and vendors to the mining community can contact Thomas French, CSP at 573-751-1422 for more information.